- Are there, from a theoretical point of view, valid arguments for supposing that a relationship exists between a pharyngoplasty and the changes in the Eustachian tube function? - What is the actual influence of a pharyngoplasty on the hearing and the speech/language development? The indication for performing a pharyngoplasty has been formulated as the patient's inability to close the velopharyngeal aperture during connected speech. This condition is called velopharyngeal incompe­tence and is based upon anatomical and functional defects leading to nasal resonance, nasal escape as well as delayed speech and language development. Two groups of children are at risk of developing velopharyngeal incompe­tence: children, who have undergone a palatoplasty and children with an intact, but congenital short or badly functioning soft palate. The diagnostic procedures are discussed together with the compensatory mechanisms, of which adenoidal hypertrophy and the increased contractions of the velopharyngeal muscles are the most important. Data from the literature focused on the hearing pathology in patients with velopharyngeal incompetence lead to the conclusion that 50 percent of these patients have hearing problems as opposed to five percent of the normal population. The commonest type of hearing pathology is bilateral serous otitis media accompanied by an average conductive hearing loss of 30 dB. The influences of the basic pathology causing velopharyngeal incompe­tence and the type of any preceding treatment are discussed. between the levator veli palatini muscle and the Kusluehian lube cartilage appears to be the decisive factor for producing Eustachian tube dysfunction. The general principles of the surgical treatment for velopharyngeal incompetence are discussed and focused on the Groningen modification of the inferiorly based pharyngoplasty. This operation allows a considerable reduction in the velopharyngeal aperture and a posterior retrac­tion of the soft palate. The immediate effects of a pharyngoplasty on the velopharyngeal structures may improve Eustachian tube function. Firstly, reduction in the oro-nasal leakage provides better protection of the Eustachian tube orifices from velopharyngeal contents. Secondly, posterior retraction of the soft palate may cause retro positioning of the levator sling, restoring an effective interplay between levator sling contraction and move­ments of the Eustachian tube cartilages. To confirm the hypothetical relationship between a pharyngeal flap and hearing, an investigation on 51 patients with velopharyngeal incom­petence was performed. Patient selection and methods employed are de­scribed. The occurrence of bilateral chronic serous otitis media is stressed as the definite criterion for hearing pathology. In the presentation of the investigation results, the relation­ships between the hearing and the speech/language development are de­scribed. Possible coherences with the fundamental pathology, the age, the performance of an adenomectomy and the logopaedic treatment are analyzed. - Approximately half of the patients with velopharyngeal incompetence, particularly if associated with a cleft palate, had bilateral chronic serous otitis media with average air-bone gaps of 33 dB as opposed to five percent of normal children. - Attacks of suppurative otitis media occurred in 35 percent of patients with velopharyngeal incompetence as opposed to five percent of normal child­ren. - Bilateral chronic serous otitis media occurred most frequently in children under six years of age. The early school years showed a change in the pattern of the obstinate bilateral chronic serous otitis media, as is also seen in normal children. - Bilateral chronic serous otitis media appeared to be related to insufficient articulation. Routine expert examination of the hearing and the speech/language development at an early age appears to be justified. - A 65 percent decrease in the bilateral chronic serous otitis media was demonstrated within three months of performing the pharyngoplasty, most frequently in children older than six years of age. This emphasizes the tendency for hearing improvement during the early school years. 1) The retro positioning of the levator muscle sling, facilitating the lifting action of this sling on the Eustachian tube cartilages as well as the dilation of the membranous wall by the dilator tubae muscle. 2) The reduced oro-nasal leakage. The reduction in the adenoid growth at the nasopharyngeal end of the Eustachian tube and the improvement of middle ear ventilation related to a higher frequency of swallowing remain hypothetical. Severe velopharyngeal incompetence tended to occur mostly in cleft palate children under six years of age and was associated with insufficient articula­tion and language production. A striking decrease in the velopharyngeal incompetence after a pharyngoplasty was found, causing an immediate reduction in the nasality and nasal escape in almost all these patients. An improvement in the articulatory skills and language production in an increasing number of patients was noticed over a period of time. 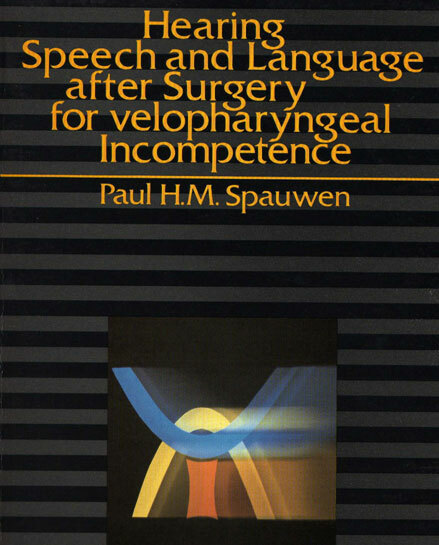 Children, who showed a decrease in the velopharyngeal incompetence from severe to normal were most likely to demonstrate improved language production. The correct choice between logopaedic or surgical treatment for velopharyngeal incompetence appears to be difficult. Particularly in dubious cases, the selection of treatment based upon anatomical-functional and developmental considerations should incline towards surgical treatment, especially as the bilateral hearing acuity may also be favoured. In this study, the ratio of cleft palate to congenital short palate is 2:1. Patients with a congenital short palate were represented more frequently than in other studies. Adequate and active management with respect to the diagnosis and the treatment may be responsible for this difference and may have influenced the referral patterns. The cleft palate children demonstrated a significantly more frequent inci­dence of velopharyngeal incompetence and bilateral chronic serous otitis media as opposed to the children with a congenital short palate. An average delay of more than three years was noticed between the onset of speech problems and the surgical treatment in children with a congenital short palate. Both children with a cleft lip and palate and those with an isolated cleft palate were equally at risk of developing speech and hearing problems. The extent of the cleft did not appear to influence the final action of the levator sling on the Eustachian tube. Children with velopharyngeal incompetence under six years of age tended to demonstrate more severe nasality and nasal escape and were more likely to develop insufficient articulation, insufficient language production and bilateral chronic serous otitis media. After a pharyngoplasty, they showed the most obvious improvement in the nasality and nasal escape, but were more resistant to the improvement in their bilateral chronic serous otitis media. AN IMPROVEMENT IN THEIR BILATERAL CHRONIC SEROUS OTITIS MEDIA. OVER A PERIOD OF TIME, AN INCREASING NUMBER OF CHILDREN SHOW IMPROVEMENT IN THEIR AR-TICULATORY SKILLS AND/OR LANGUAGE PRODUCTION. IN A SELECTED GROUP. THE POSITIVE EFFECTS ON THE SPEECH AND LANGUAGE DEVELOPMENT AS WELL AS ON THE BILATERAL HEARING ACUITY JUSTIFIES PERFORMING A PHARYNGOPLASTY AT AN EARLY AGE SO PROVIDING THE CHILD WITH THE TOOLS FOR DEVELOPING NORMAL SPEECH AND LANGUAGE.